It’s mid-summer, which makes it the perfect time for another installment of Lessons Learned. I’ve been thinking that this would be a great habit for me to keep up long after I stop traveling. It will motivate me to keep living the type of life that allows me to fill pages of a book with interesting, funny, and sometimes hard-earned lessons and give me time to reflect as I navigate my way through life. I certainly have no shortage of entries as we continue our travels living in 80 square feet of tent each night. The earth beneath our feet is made up of many colors and shades, not just brown. I knew this, but it didn’t register completely until we began traveling in Utah. 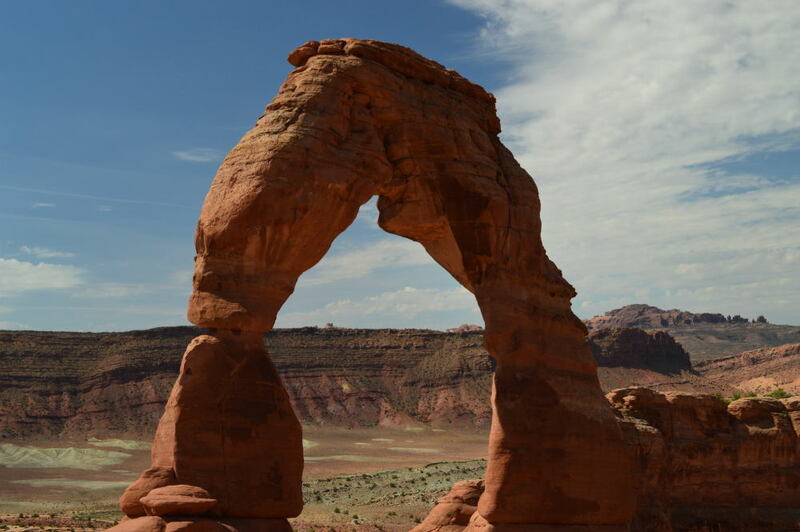 Utah must have soil that spans every color in the spectrum. I’ve seen brown, red, orange, pink, white, blue, green, you name it! Even with all the colors of the rainbow, deep, rich brown is still my favorite. I am not as dependent on a water spigot as I had thought. Early on in our travels, we moved along from a campground after one night because it didn’t have any water. 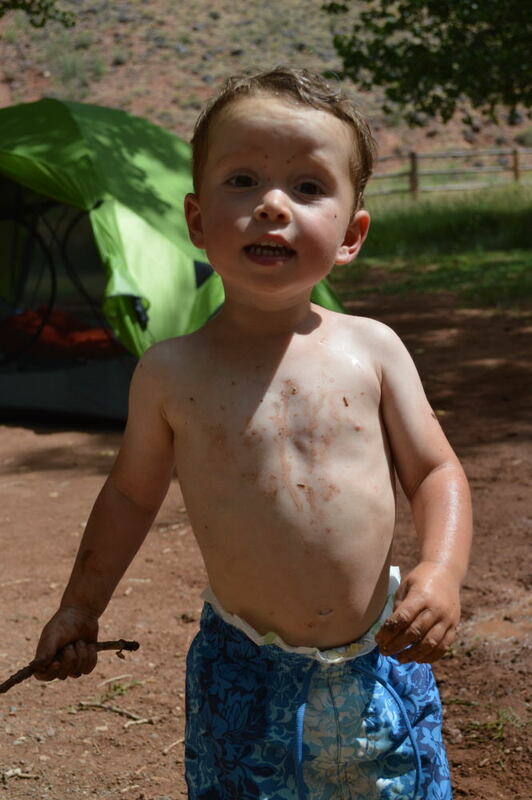 We both felt that access to water from a spigot (even if there were no flush toilets or showers) was indispensable when traveling with a toddler. Almost every other place we camped, through Nashville, had running water and hot showers. Since camping in Nashville (oh so long ago), we have not camped in a single place that has had free showers. Most have had no showers and often no running water except for a spigot to fill water bottles. The few that did have showers have had pay showers. We’ve learned to make do quite well by showering (when we feel like it) with our dromedary bag. It takes some creativity, but it actually works really well. So well, that we successfully camped for three nights in Canyonlands National Park at a campground with no water at all. The nearest potable water was a mere ten miles away, but the power for that well actually went out one day, so potable water turned out to be a fifty mile drive away from our site. And we did just fine. In fact, that was one of the very best places we’ve camped on this trip. As long as we make sure to keep all of our water fully stocked when we think we may run into a dry spell, we have absolutely no need to camp with running water. I acclimate to the heat much more quickly when I live outdoors. Anyone who knows me well knows that I’m not a hot weather gal. This, despite the fact that I’ve lived in the DC area for the past eight years. We just got through with a long day in the sun filled with several hikes and limited shade, and I felt great. And it was 102 degrees! Granted, humidity in Utah is just not the concern it was back home, but 102 is 102. I realize that since I’m not living and working in climate controlled locations, I’m able to adapt much more easily to the weather around me, making my days (and nights) outdoors that much more pleasant. The only conversation starter better than a toddler is a toddler in a Yankees cap. I must admit that neither Alan nor I are big into baseball. The cap was a gift to Van from his Gran, who happens to be the Yankees’ number one fan. I understand that people might dispute this, but I’m willing to take on that dispute with anyone. As for the hat, Van gets comments on it wherever we go, and quite a few passionate ones. There are Yankees fans and Red Sox fans EVERYWHERE! I’m happier outside. This isn’t anything new, but it’s never felt more true. Van is even more flexible than we thought. We knew that for this adventure to be fun, Van needed to be flexible. He was already a flexible kid, not too bent out of shape if his nap was a few hours later than usual or even if he had no “usual” nap time as long as he took a nap. But we had no idea that he’d take so well to living on the road and the irregularity that naturally ensues. A nap at 11:30 one day and 5 the next? No problem. Packing up a campsite every few days for a brand new one? No problem. In fact, if we’re not heading out on a hike or a road trip every day or so, we have a little taskmaster on our hands who begs for the next road trip and hike. And at the end of each, we often get a round of applause and hear our backseat driver/hiker say “good hike” or “good road trip” not too long before requesting more. This kid cracks me up! Busyness does not equal stress. For most of my life, I was under the impression that when you’re busy, there’s a certain amount of stress that naturally hangs on for the ride. After the last few months on the road, I now realize that while busyness is sometimes (or maybe even often) accompanied by stress, it is not an automatic passenger. When we describe to folks that we’re traveling for an indeterminate amount of time, I think that there is the misperception that we’re living a life of leisure with nothing to keep us busy. While I can’t argue that we are living a certain type of person’s dream life and there is a fair amount of leisure involved, it is also an incredibly busy life. We’re constantly thinking about where we’re going to sleep that night, where we’re going to buy food, how we’re going to get water, do laundry, get the oil changed, take a shower, get reception to check voicemail and email, calm down a boy who’s had too much sun and too little sleep, and the list goes on and on. There are many things that become much more complicated when you don’t have a home – especially when you have a two-year old along for the ride. This is all a long way of saying that I’m busy, not the busiest I’ve ever been (I did work in biglaw), but busy nonetheless. And it’s not stressful! It’s a beautiful thing to realize since I thrive on being busy – but now I know that the stress is entirely optional. Of course, the key is being busy with things you’re in control of, that you enjoy, and that you have enough passion for that you don’t burn out or get bored.